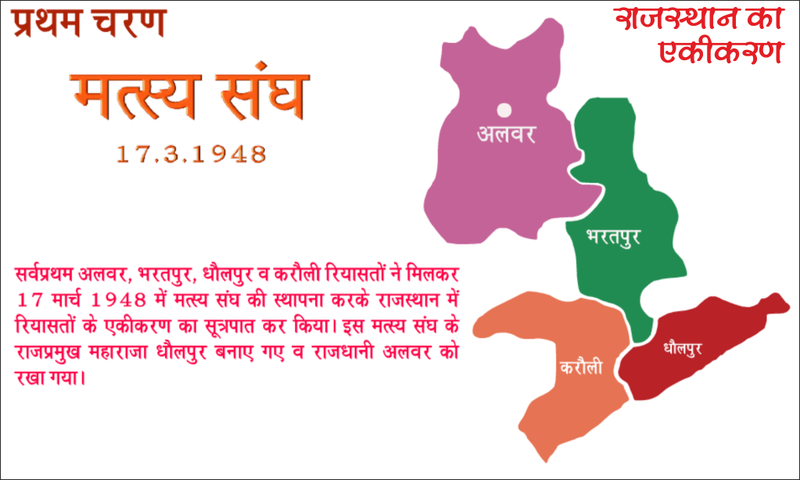 A total of 19 states of Rajasthan integration time 3 Tikane- Kushlgdh lava, and Neemrana, and integration of a Chifshif Ajmer-Mervadha Thekrajsthan 7 stages 17/18 March 1948 starting from November 1, 1956 was held the integration of Rajasthan in 8 years, 7 months, 14 days total time it took. The Elder Riasatthy Mewar in Rajasthan state. 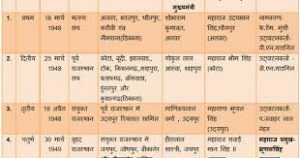 ntegration time in Rajasthan Alwar, Bharatpur, Dholpur, Dungarpur, Jaipur and Jodhpur in Rajasthan, not the states wanted to meet. Alwar state concerned is linked to the assassination of Mahatma Gandhi on suspicion of murder and Dewan MB Tejasinh ruler of Alwar Khare kept close watch in Delhi India’s first Independence Day celebrated Thakalvr infield.